Prince George's County Fire Investigators are looking into the cause of two overnight fires. Firefighters quickly handled these incidents occurring early morning, May 12, 2011. The first incident occurred just before 1:00 am at Big Bens Market at 805 Larchmont Avenue in Capitol Heights. Firefighters arrived to find a two story commercial structure with fire and smoke showing from the second floor. Firefighters initiated an interior attack and quickly extinguished the fire. Investigators indicated the cause and origin are under investigation. The fire loss is estimated at approximately $35,000.00 total for the structure and contents. At about 1:30 am Firefighters were alerted to a house on fire at 6306 Gateway Boulevard in District Heights. Upon arrival firefighters discovered a 1 ½ story single family dwelling with fire showing from the 1st floor on the rear side of the structure. An interior attack as well as a search and rescue was initiated. The fire was quickly extinguished and searches confirmed the lone occupant had exited the burning structure safely prior to the Fire/EMS Departments arrival. The Fire/EMS Departments Citizens Services Unit was on the scene and provided assistance to the displaced occupant. Fire Investigations classified this fire was also under investigation. The fire loss is estimated at approximately $75,000 total for the structure and contents. No injuries reported. As indicated, both of these fires are under investigation. Officials are conducting a full investigation into each of these incidents. At this point nothing has been ruled out as a cause and each case will be reviewed for similarities. UPPER MARLBORO, MD – Today, Prince George’s County Executive, Rushern L. Baker, III submitted seven agency and department heads to the County Council for approval for permanent appointment. The appointments by County Executive Baker are as follows: Marc Bashoor, Chief of Fire/EMS Department; Eric Brown, Department of Housing and Community Development; Gail Francis, Director, Office of Finance; Thomas Himler, Director, Office of Management and Budget; Monica Johnson, Director, Office of Central Services; Mark Magaw, Chief of Police; and Samuel Wynkoop, Jr., Director, Department of Environmental Resources. In accordance with the County Charter (Section 322: Confirmation of Administrative Appointments), heads of agencies in the Executive Branch, as well as members of boards and commissions, are subject to confirmation by the County Council, which must act to confirm or reject such appointments within forty-five days of their submission. The County Council must also hold public hearings on all appointments not less than thirty days after they are submitted by the County Executive. Submitting these appointments today ensures that the Prince George’s County Council will have the necessary time to act upon them before its August recess. Marc Bashoor returned to serve Prince George’s County as our Interim Fire Chief, effective December 6, 2010. A retired 23 year veteran of the Prince George's County Fire/EMS Department, with 29 years of service in the emergency service field, Interim Fire Chief Bashoor is also a Prince George's County native and Bowie High School graduate. Interim Fire Chief Bashoor began his service to Prince George's County as a volunteer member at Bowie Fire Station 39. 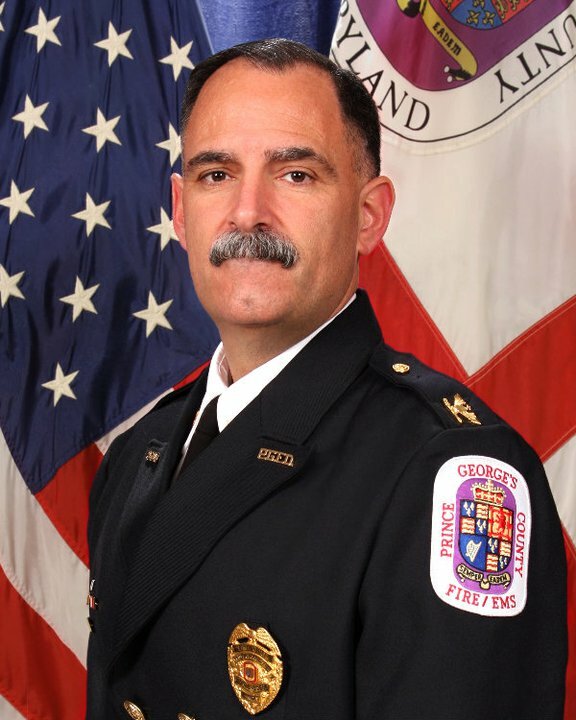 During his 23 year career, Interim Fire Chief Bashoor rose through the ranks of Prince George's County Fire/EMS Department receiving numerous citations and commendations including the Fire/EMS Department Silver Medal of Valor in 2004. Interim Fire Chief Bashoor is a tenured fire service adjunct instructor with the Texas A&M University, National Emergency Response and Rescue Training Center. He also serves as an adjunct instructor with the Emergency Responder Safety Institute, as well as with the Regional Education Service Agency in Martinsburg, West Virginia. In 2003, Interim Chief Bashoor was recognized by the Maryland Police Training Commission as an Incident Command System subject-matter-expert. He has achieved State of Maryland and National Pro-Board certification as a Fire Officer IV, Fire Instructor III, and Fire Inspector I.
Concurrent to his emergency management duties in West Virginia, Interim Chief Bashoor has also served for the past three years as a consultant with the United States Veterans Administration Central Office in Washington, DC, to assist with the development of continuity plans and National Incident Management System implementation throughout the Veterans Administration. Interim Chief Bashoor also served as a member of FEMA's Technology Transfer Working Group. Read the Washington Post article by clicking here. The Prince George's County Fire/EMS Department is proud to assist in a relief effort "All in for Alabama." Citizens and residents can drop off items that will be provided directly to relief support agencies in Alabama. Citizens and residents can simply go the their local fire/EMS station in Prince George's County and we will gladly accept your donation. This effort will last through May 24, 2011. Parts of our Nation have suffered unprecedented destruction from a series of natural disasters. Numerous relief efforts are underway and the combined resources of our career and volunteer Fire/Emergency Medical Services (EMS) Department has been asked to assist. "All in for Alabama" has requested that our stations serve as collection points for our citizens that want to donate items. Prince George's County Fire Chief Marc S. Bashoor, along with Andrew Pantelis, President of the IAFF Local 1619, and Bill Smith, President of the Volunteer Fire and Rescue Association, wholeheartedly support this effort and we have agreed to open our doors to accept these items. Starting Thursday, May 12, 2011, our community based Fire/EMS Stations and the Union House in Bowie will be open to accept donations on behalf of the "All in for Alabama" relief effort. Donations will be accepted through May 24, 2011. The coordinating relief effort will come to each station starting on this date and will deliver the donations later that week. The supplies and donations will go directly to shelters across Alabama that are serving those affected. Please help us support our efforts for so many in need, as Alabama has experienced the most devastating tornadoes in their history. Any questions should be directed to relief effort coordinator, Lucy Stefanelli, at 240-253- 3576 or by email at Lucy.a.stefanelli@gmail.com with Alabama in the subject line. A message from "All in for Alabama"
Goal: We are challenging everyone to donate needed items for the relief efforts in Alabama! The supplies and donations will go directly to shelters across Alabama that are serving the victims! Please help us in supporting so many in need, as Alabamians have experienced the most devastating tornado's in Alabama history.